I've been using it for about 5 months and I‘m very satisfied with it’! It is bright and I love the touch screen sensor for brightness adjustment. 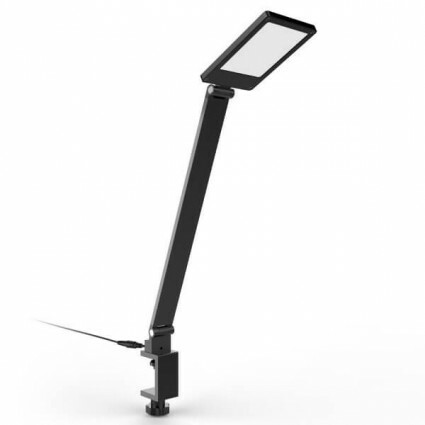 This desk lamp can be easily fixed on the desk, saving a lot of space. And there are 3 lighting modes for me to choose, very convenient. This desk lamp came well-packaged, it's very bright, and can change the brightness in 3 modes, very practical. This lamp works well, everything is great, and it would be better if the lamp arm could be adjusted. This lamp is small enough not to take up too much desk space, very perfect for reading or studying at night. I like the slim and fashionable design very much, very easy and convenient for me to carry anywhere. I bought this lamp to put it in my bedroom and the adjustable function is very helpful. The only regret is that the lamp arm is not adjustable. Perfect for studying, the one-touch operation is very sensitive. So I can freely adjust the brightness according to the different environment. I like the compact design so much, and the clip-on installation is very easy, very convenient to use. I really like the ability to adjust the different levels of brightness. and it stays cool even if I used it for hours. Perfect purchase.